European standards are applicable for the reduction of the high noise loads to improve the quality of life of the public. In 2010 we launched our active noise protection solution in the market with our ALTO® impregnated wood Noise Barrier Wall System and Bird Barriers. In developing the ALTO® noise barrier walls our primary objective was to satisfy the highest quality and aesthetic requirements while meeting the resource capabilities of the owners. 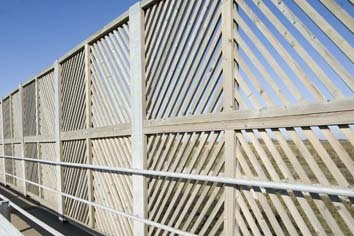 Gradex Ltd. offers both the manufacture and installation of ALTO® noise barriers and bird barriers. 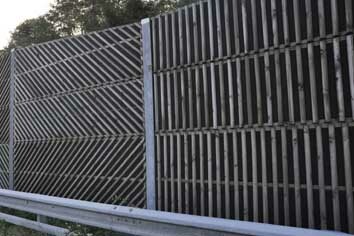 Our noise barrier system provides solution to control different noise levels. It can be used along roads with lower and higher noise loads and also to reduce railway noise. Its appearance features wooden panels with vertical or diagonal or woven latticework, with various panel colours. ALTO® noise barrier walls perfectly blend into the natural environment and prevent monotony. ALTO-1®, ALTO-2®, ALTO-3® feature noise absorption on one side, while ALTO-Dupla® provides noise absorption on either side. We also offer ALTO-TP polycarbonate and ALTO-TU hardened glass noise barriers. Polycarbonate and hardened glass noise barrier walls can optionally be delivered with wooden or aluminium frame. Bird barriers are used to protect birds migrating along roads. They will cause birds to ascend to a higher elevation over highways with heavy traffic, thus avoiding collision with vehicles. Appearance: Latticework, woven, policarbonate or hardened glass. Each type of wall features very high quality and aesthetic appearance. The hardened glass type has wooden frames, the latticework can be vertical or diagonal.